We encourage all Classics students (and, indeed, non-Classics students) to consider studying abroad during the undergraduate years, whether for an intersession, a summer program, a semester or a year! The Office of Study Abroad can help guide your plans, but we also recommend talking to Classics faculty about the possibilities. If you missed this Fall’s Pizza and Plans session on Classics study abroad on 9/19/18, here’s the presentation with live links. Intercollegiate Center for Classical Studies in Rome: An excellent, intense, Classics-centered semester program. Dr. Pasco-Pranger is an alumna of “the Centro” and would be glad to talk to you more about it. American School for Classical Studies at Athens: The ASCSA Summer Session offers an intensive introduction to Greece from antiquity through the modern period; Summer Seminars are more topically themed travel study. Dr. Ajootian especially, but also Dr. Cook, Dr. Fenno and Dr. Lobur have spent time at the ASCSA and are good resources for more information. N.B. There is a competitive Eta Sigma Phi Scholarship to this program. Watch this space for updates on the next offerings. MAY INTERSESSION 2019 Eternal Cities: Study Tour of Rome and the Bay of Naples (May 13-29): Dr. DiBiasie-Sammons will teach a travel course centered on the art and archaeology of Rome and its environs and the Bay of Naples region (Pompeii, Herculaneum, and Naples itself). The 300-level course will carry three credits. Information on costs, application, can be found here. SUMMER 2019 Ancient Graffiti Project in Herculaneum (June 5-20): In Summer 2019, Dr. DiBiasie-Sammons will again take a small number of students to work on this project of digitally recording, measuring, drawing and mapping all the extant graffiti in Herculaneum, on the Bay of Naples in southern Italy. At least one year of Latin is preferred for participation. Information on costs, application, etc. is coming soon. Deadline for application in February 15; contact Dr. DiBiasie-Sammons for more details. 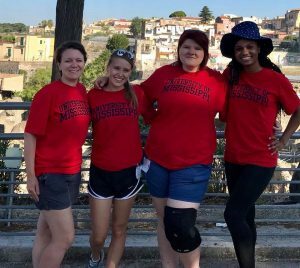 In Summer 2018 three UM students along with students from Wabash College and several UK universities joined the AGP team in Herculaneum; Dr. DiBiasie-Sammons is the field director of this project. The students spent two weeks digitally recording, measuring, drawing and mapping extant graffiti in Herculaneum, on the Bay of Naples in southern Italy. Explore these other options and come discuss them with the faculty if you’re interested! The Athens Centre offers some unusual small scale programs in the summer, including modern Greek instruction. Greek and Latin Summer School, University College Cork, offers intensive (and surprisingly affordable) intensive language study in Ireland. Archaeological Fieldwork Opportunities Bulletin is the AIA’s listing of field schools and digs; talk to Dr. Becker or Dr. Ajootian for guidance in sifting through these opportunities. Paying for study abroad can be daunting, but the rewards are great. Plan early and be aggressive about pursuing scholarships. Some financial aid you’ve already qualified for may be transferrable to your program, and more so for faculty led or affiliated programs. Whether you usually do or not, fill out a FAFSA in January of the year you plan to study abroad. Since the costs of studying abroad are almost always higher than staying home, you may qualify for some aid even if you usually don’t. Consult with the Office of Financial Aid on this issue. The Office of Study Abroad also keeps a list of study abroad scholarships that you should look through. If you are a Pell Grant recipient, note especially the Gilman International Scholarship Program. Many of the programs listed about also have program specific scholarships or financial aid, some of which can be quite substantial. Through a generous gift of alumni Mike and Mary McDonnell of Memphis, the Department of Classics is able to give substantial support to Classics majors for study travel through the McDonnell Endowment. Requests for support are accepted throughout the year and will be considered on a rolling basis. To apply, please send to Dr. Pasco-Pranger a letter (e-mail attachment is fine) describing the planned program and how it fits into your educational and/or career plans, and a budget showing your financial need. For Eta Sigma Phi members, a set of scholarships for summer study and archaeological field school projects is available. Deadline for all is February 15. The Etruscan Foundation supports fieldwork in Italy. Applicants must be members of the Etruscan Foundation and applications are due in February 22. The Jane C. Waldbaum Archaeological Field School Scholarship is offered annually by the Archaeological Institute of America. “The scholarship is open to students who have begun their junior year of undergraduate studies at the time of application and have not yet completed their first year of graduate school at a college or university in the United States or Canada.” Deadline is March 1. The Society for Classical Studies offers a scholarship for minority students for Summer 2019 to further an undergraduate’s preparation for graduate work in classics or classical archaeology. Eligible proposals might include (but are not limited to) participation in classical summer programs or field schools in Italy, Greece, Egypt, etc., or language training at institutions in the U.S, Canada, or Europe. The maximum amount of the award will be $4,500 and the receipt deadline is December 14.